Going to local farmer’s markets has been one of my favorite things to do for quite some time now. Not only am I supporting the local farmers, growers, artisans, and crafters, but it’s the best way to get fresh food and goodies. San Diego is known for our abundance of farmer’s markets throughout the different towns, in fact, there is actually a farmer’s market on every day of the week somewhere in San Diego. To check out the official farmers market schedule, go here! My personal favorite of them all is the Vista Farmer’s Market, held every Saturday, year-round, from 8am-1pm at the Vista Court House. This farmer’s market is not only my favorite, but it is also the oldest market in San Diego, making it worth the visit! The first thing I like to do when getting to the farmer’s market is grab an iced latte! Caffe Espresso, the coffee cart on the far left of the market, is serving up traditional coffees with a gourmet twist. Two drink recommendations that you have to try is the mocha frap and coconut latte, both pictured above! The coconut latte is made with fresh coconut cream combined with either espresso or fresh cold brew. 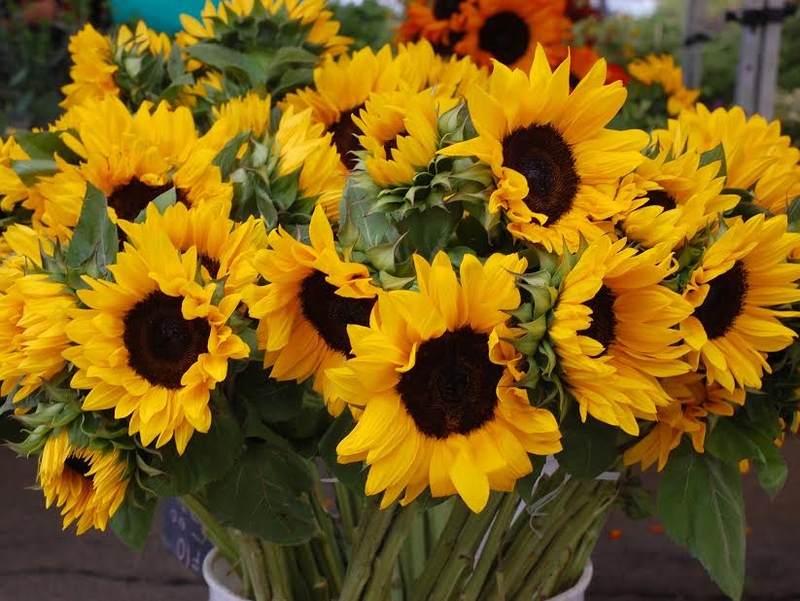 The flowers at the farmer’s market are so fresh and fragrant. I love coming here for their reasonable prices, but excellent quality. For $5 you can get a bundle of lavender or a bunch of sunflowers! Tip: If you are having a dinner party or doing a flower arrangement, plan your week around grabbing flowers from one of the many markets! Homestead Microgreens has fresh sprouts and microgreens from Temecula. There are many varieties to the style of microgreens, such as peas, sunflowers, basil, and others! My favorite thing to do with the sprouts is make avo toast. Here is what I do– using sourdough (I got rosemary sourdough from Fraizer Farms), I grill both sides until toasted in olive oil. Then, I melt mozzarella cheese, add this to the bread. Fry one sunny-side up egg. The layering goes: bread, mozzarella, avo mash, roasted turkey slices, sunny-side up egg, topped with fresh sprouts, olive oil, and salt & pepper. Close to Home Pasta makes various homemade pastas locally in San Diego. In addition to original pasta, they are making unique flavored pastas, such as rosemary, lemon sage, garlic, etc. I combined the fresh pasta with mozzarella, Basiltops pesto sauce, basil mircrogreens, and topped with Pacifica Culinaria Olive Oil, all found at the Vista Farmer’s Market. With all local California olives, Pacifica Culinaria makes and processes all oils locally. Pacifica Culinaria has various offerings of vinegars, olive oils, and other oils. 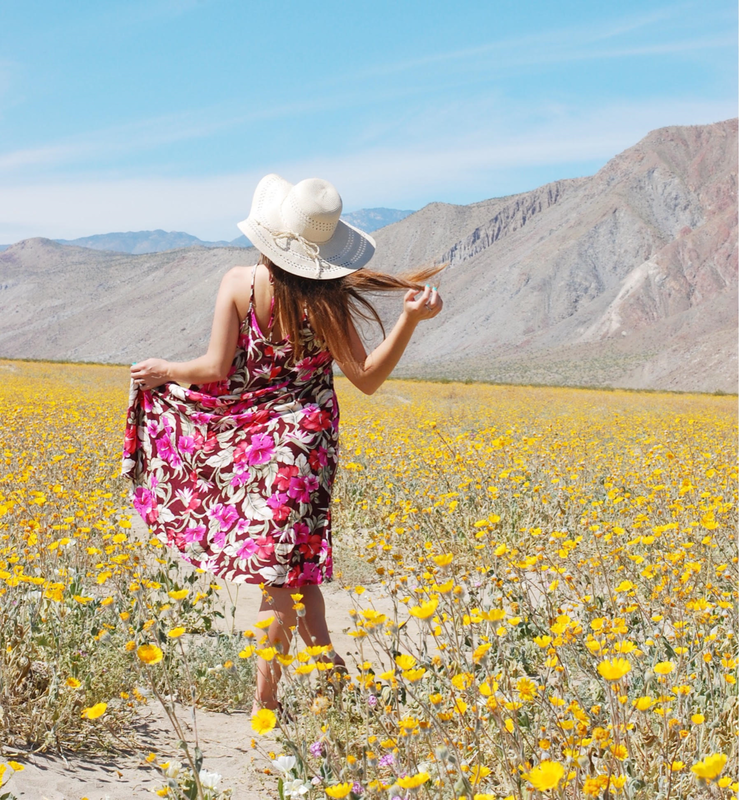 All of their olive oils are certified extra virgin oils, which the difference is in the taste. My personal favorites are the dipping oils. These can be enjoyed as a dip for bread, salad dressing, or an alternative for sauce on pasta! The flavored vinegars compliment a fresh summer salad perfectly! Basil Tops, a local company in Vista, produces basil pestos from delicious ingredients! They create pesto sauces in pouches. 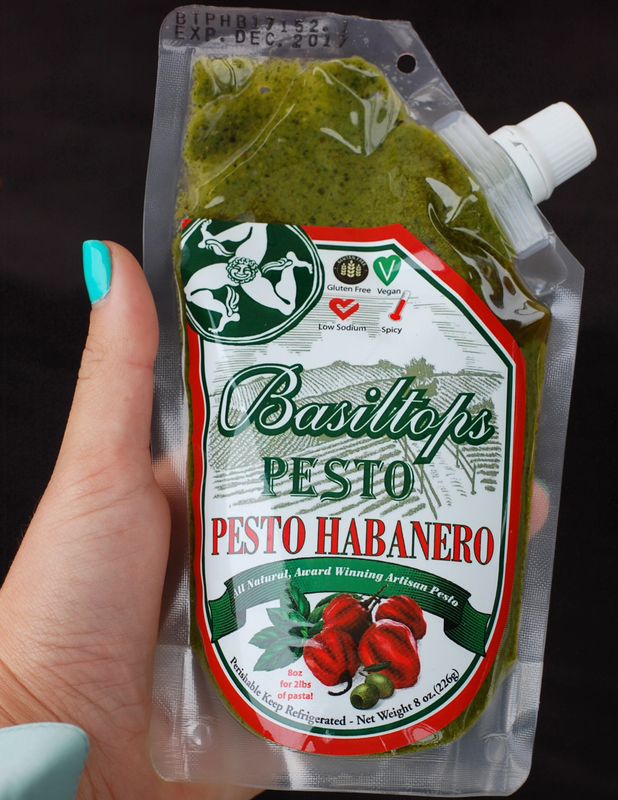 The pesto pouches can be used as dressing, condiments, or sauce. With a variety of flavors, they have nut-free options, dairy-free options, and anything in between. We used the sundried tomato pesto on the fresh pasta from the market! Basil Tops can also be found in local grocery stores, such as Frazier Farms! The most common reason people visit farmer’s markets is to get local and fresh fruits & veggies. With countless local farmers bringing their produce to sell, you can find all the fresh picked crops of the day! There was even a lady selling fresh eggs from her chickens. Eating raw, unprocessed food has never been so easy! The Brazilian Guys are serving up creamy and fresh acai bowls, along with their famous stuffed hash browns. Let’s start with the acai bowl– they use creamy acai sorbet, topping it with granola, strawberries, bananas, and drizzled agave. This sweet, tart, crunchy, and creamy bowl hits the sweet tooth perfectly, without feeling guilty. In addition to this, they have their well-known stuffed hash browns. They have a couple of variations that you can order–either potatoes, sweet potatoes, or cassava. Cassava is a South American starchy root similar to potatoes. They mash these and then use it as a shell, while stuffing it with eggs, cheese, spinach, bacon, ham, etc. It reminds me of an inside-out omelet, but way better! Da Big Show, a group of BBQ loving chefs, is serving up BBQ in a unique way! Their famous signature sandwich is a crowd cheeser with pulled pork, brisket, bacon, jalapenos, topped with BBQ sauce (homemade of course), nacho cheese, all piled on a French roll. Not full after that? Save room for their cheesey mac n cheese, along with their baked beans, and tri-tip! They bring their smoker to the farmer’s market each week just to serve it up straight from the grill, making it as fresh as possible! Belgian Delights serves freshly made Belgian waffles and crispy frites! The waffles are served with Nutella and creamy whipped cream. The waffles are made to order, and the owner makes each of them on hot waffle pans in his booth! Get your order in fast for these before they run out! The other specialty here is the frites. These are crispy French fries. What I like most about these is the homemade garlic dipping sauce! This sauce was one of the most delicious, creamy, garlicy sauces I have ever had. I put it on all of my food that day! There is some talk that the owner is soon to sell the sauce by the bottle, stay tuned! I am not exaggerating when I say this, but this is the best chicken I have ever had in my life, and the main reason I come to the market each week! 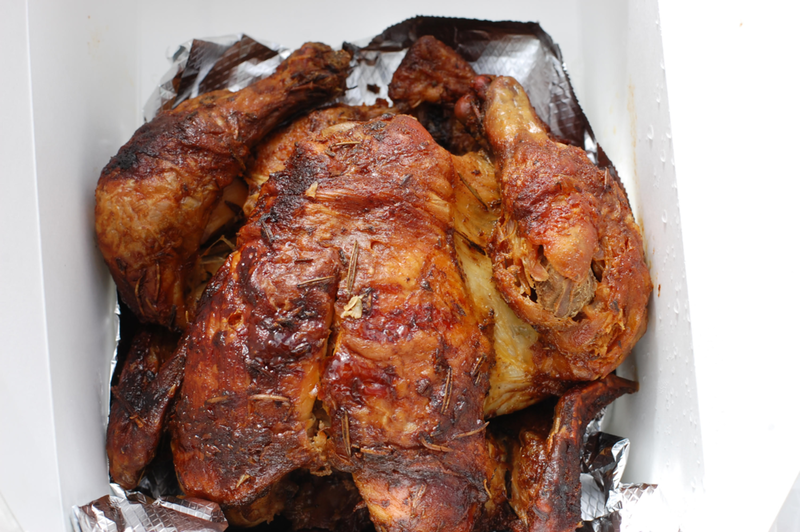 The owner, Daniel, is from Switzerland, and is serving juicy, fresh, cage-free, organic rotisserie chicken. In addition, he makes roasted veggies and potatoes, cooked in the fresh chicken drippings. Topping off this delicious meal, he has homemade BBQ sauce to dip it all in! This is a great meal to take home for the whole family. Gianni, the owner, quit his full time job to pursue his cooking dreams. Good thing he did, because these are the most amazing Italian bites. Gianni’s is serving up zeppoles, classic Italian donuts. These are like sugar fritters. In addition to these, he is making apple-pie fritters, which is a fritter filled with apple pie filling and then fried. 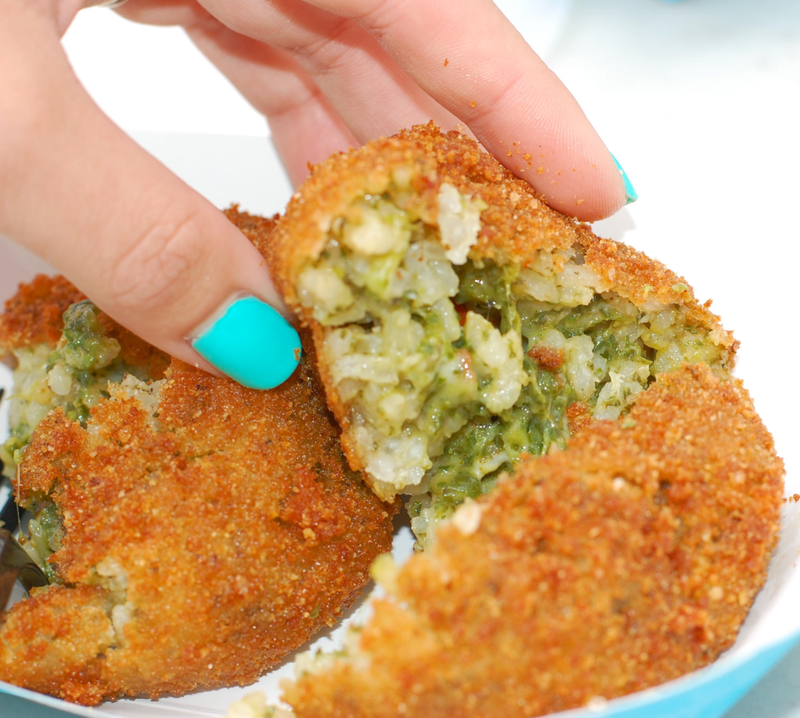 On the savory side, he makes risotto, pesto, and Bolognese balls. All of these are freshly made and fried at the market. They are little bites of heaven. I mean, fried meat sauce, surrounded by creamy risotto… Does it get any better? Any craving can be satisfied with these fried bites! On the second Saturday of each month, the Vista Farmer’s Market hosts local retail vendors to sell their products in addition to the usual food vendors. Of all the vendors, Healthy Kitchen Supplies is my favorite! Some of their unique kitchen products include the above silicon stretch lids. The uses for these are endless. Lemons, watermelon, bowls, cups, or strange shaped items can be covered and sealed with these stretch lids!